You: What if going to Africa isn’t in my future? Me: What my eyes are seeing is certainly shocking and heart breaking. Poverty is plentiful here. But, I am also still very well aware of home. My family and the mission field of my children rule over my heart. If you remember, when I started this journey, I never imagined going to Africa. It wasn’t whispering to me. But I am certain that God placed the ministry of Sole Hope in my path on purpose. 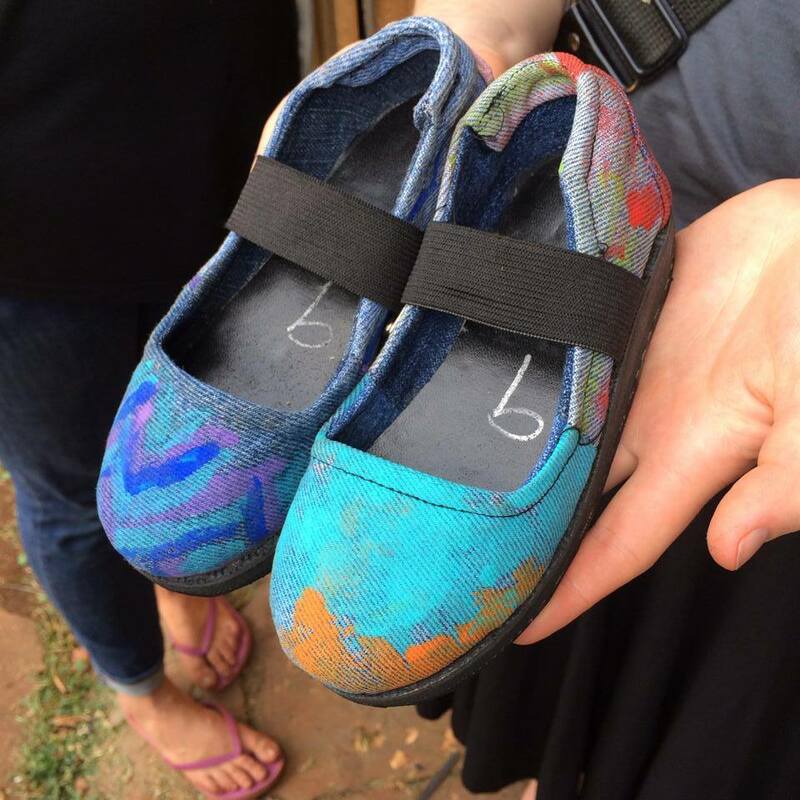 What I absolutely love, love, love about Sole Hope is that they have invented a way for you, right where you are, to make a difference AND create community. It is so very simple. Purchase a Shoe Cutting Party kit here. Get your girlfriends together, (include snacks and beverage if you want to get the party started), with their old jeans, a pair of scissors, and $10.00. Trace the pattern from the Shoe Cutting Kit onto the jeans as awesome tunes blare and great conversation is happening. Cut the pattern out and pin the shoe sets together. Trust me they explain it all in the kit. Collect the cut-out patterns and mail them to U.S. Sole Hope headquarters with the $10.00 collected from each guest. The $10.00 goes towards paying the shoe makers fair wage. I have met the tailors and shoe makers and they are awesome. Such servants! That is it! Seriously so easy and FUN!!! And take a look at the finished product in action!!! They are practical and durable. Mamas! This is made for us. I have to say it again: THIS IS BRILLIANT. Get your moms’ groups together, your small group, your girl friends, your women’s ministry, and DO THIS! Instead of sitting around with grumpy family members on holidays have Uncle Bob cut out shoes. Bliss right? Get the point? Anyone can do this and you can do it at any time. 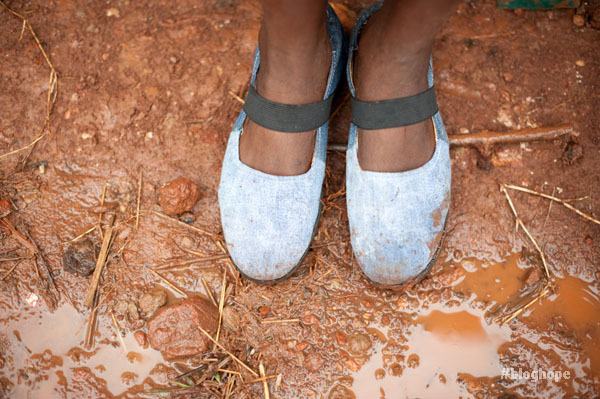 Your shoes then go onto the kids after they have the jiggers removed from their feet. They are first educated about how to keep their feet clean. I have seen this process first-hand. We visited a village yesterday for a follow-up check-up and I was curious what the lasting effects of the initial visit would be. It was so awesome. 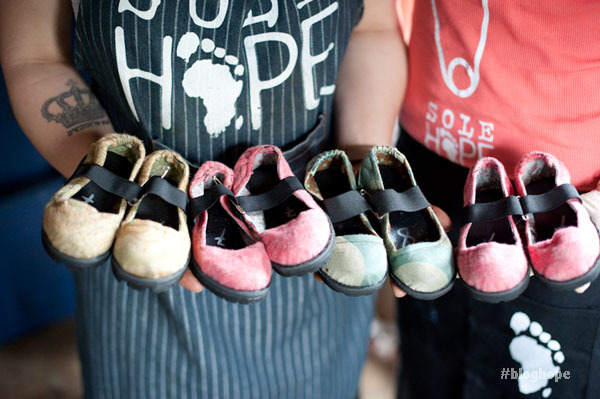 Sole Hope shoes were all over the place. Most kids flew through the jigger check-up process, then got a sweetie (sucker), and a fresh pair of shoes. Look at this guys smile as he gets a new pair of shoes?! Awesome right? And you can be a part of all the incredibleness in Jinga, Uganda through your old jeans. You may not be in Africa but your jeans can come. Send them on over. P.S. – Sole Hope also has a wish list should you want to help them add some bonus items to their ministry. I know they are going on my Christmas gift list.